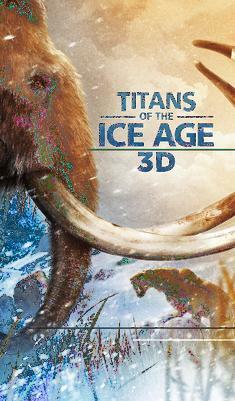 [ALBUQUERQUE, NM – August 12, 2013] – Titans of the Ice Age, one of the most highly anticipated giant screen releases this year, is an action-packed immersive portal to the great Pleistocene ice age, 20,000 years back in time. Narrated by Academy Award® winning actor Christopher Plummer (The Sound of Music, Up, The Girl with the Dragon Tattoo, The Beginners), Titans of the Ice Age transports viewers to the otherworldly frozen landscapes of the northern hemisphere 10,000 years before modern civilization. Opening at the Lockheed Martin DynaTheater on August 30, 2013, Titans of the Ice Age brings this harsh and beautiful era to life – a world buried in our ancestral memory, populated by saber-toothed cats, giant sloths, dire wolves and the iconic woolly mammoths. Travel across monumental glaciers and sweeping grasslands, rich in life. Roam the mammoth steppe with baby Lyuba, a female Woolly Mammoth calf recently exposed by the melting Siberian permafrost, now one of the best preserved mammoth mummies in the world. Discover the story of Zed, one of the most complete Colombian Mammoth skeletons ever uncovered, extracted in 2008 from under a Los Angeles parking lot next to the famous La Brea Tar Pits. Witness a time when titans ruled untamed continents and humans walked with giants. As one of the first films shot using ultra high definition digital cameras, Titans of the Ice Age is a visual experience new to the giant screen medium. Stunning backdrops shot on location at Yellowstone National Park, the Northern Great Plains, the Rocky Mountains and Alaska provide the scenery on which the drama of the Pleistocene unfolds. State-of-the-art, ultra-HD CGI allows long extinct Ice Age mammals to populate this world in photorealistic detail alongside Paleolithic humans, played by native Iñupiat and Yup’ik Alaskans. Titans of the Ice Age captivates audiences with a vision of a changing world, a time of new ecological pressures—leading us to consider the possible fates of today’s living mammals. As our climate continues to warm and human encroachment threatens the existence of thousands of species, could the megafauna of our millennia—elephants, bison, tigers—be lost to time like their Ice Age cousins? Titans of the Ice Age provides a bigger-picture perspective on the relationship between climate, the Earth, its resources and inhabitants, offering a cautionary tale that is more relevant today than ever. Titans of the Ice Age: 10 a.m., noon, 2 p.m. Flight of the Butterflies: 11 a.m., 1 p.m., 3 p.m. The Lockheed Martin DynaTheater is located in the New Mexico Museum of Natural History and Science, 1801 Mountain Road NW, Old Town Albuquerque. It offers a 3D experience on a 5-story screen. Titans of the Ice Age is locally sponsored by the Albuquerque Journal, 100.3 The Peak, Channel 95.1 All the Hits and KZRR 94 Rock. Titans of the Ice Age is a production of Giant Screen Films and D3D Cinema, in association with The Field Museum, Chicago.